It had been a while since cheers of praise were heard during a Montebello Unified School District board meeting, but on Thursday, teachers, parents and students were on their feet celebrating news that a controversial top administrator had been fired. Getting the axe is Chief Business Officer Ruben Rojas who at one point was on administrative leave over questions regarding the truthfulness of information in his resume and job application, which have since proven to be full of false statements and made-up references. The firing comes months after unions representing MUSD employees and the public began calling for an investigation into Rojas’ hiring. Rojas’ detractors also blamed him for MUSD’s tenuous budget situation, saying he had presented a false rosy picture of the school District’s financial outlook, and alleged he had improperly awarded District contracts. Board members had come under fire for their failure to act swiftly and openly on the matter. They were criticized for not fully vetting Rojas before he was hired. Board members Hector Chacon and Edgar Cisneros presented the motion to terminate Rojas during a closed session meeting Thursday: the vote was 5-0 to approve. “The composition and direction of the Board member has been continuously evolving over the past year and with that evolution, comes a set of new priorities,” said Board Member Ben Cardenas in a statement explaining the Board’s decision. The news was announced during the special board meeting later that evening, prompting loud applause from a stunned, but pleasantly surprised audience. While many MUSD employees and parents called the firing of the Rojas a “good first step,” others felt it’s too little, too late. Over the last two months, chants of “no mas Rojas” (no more Rojas) could be heard during protests outside district headquarters, where teachers, staff, students and others loudly expressed anger over the board’s failure to fire Rojas while hundreds of employees were losing their jobs due to MUSD’s deep budget hole. It was less than a year ago that the public seemed to have little reason not to trust Rojas, who at the time pushed for approval of Measure GS, a $300 million bond for infrastructure improvements. Voters overwhelmingly approved the bond in June 2016, but by September 2016, the feelings of goodwill were gone and Rojas was put on paid administrative leave over a personnel issue related to discrepancies in his resume, only to be reinstated one month later. The California School Employees Association (CSEA) Montebello Chapter 505 passed a “vote of no confidence” in Rojas the following month, accusing him of hiring acquaintances, lowering morale district-wide and pushing costly contracts. The lack of action by the board to fire Rojas and impending layoffs prompted a recall effort against Cardenas and Board President Lani Cupchoy. Ultimately, 333 MUSD employees received layoff notices as part of the district’s plan to address a $17 million budget deficit. Two-thirds of those cuts were to teachers. “If the pink slips are rescinded there will be a sigh of relief, but some of the damage will not be undone,” said Shaun Kury, band director at Montebello High School. He is among those who have has received a layoff notice. 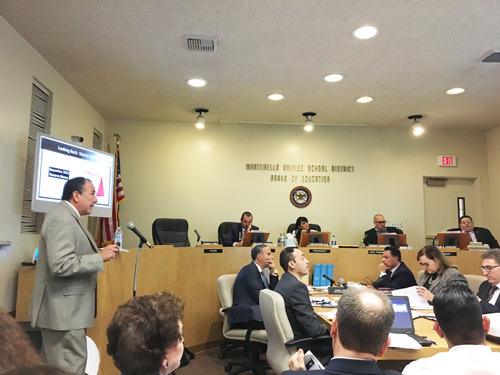 The board voted Thursday to give MUSD Superintendent Dr. Anthony Martinez the authority to rescind layoff notices as the budget allows, signaling their willingness to reconsider some of the job cuts in their budget stabilizing plan. “If we don’t start rescinding [soon], another district is going to steal our talent,” said Chacon, emphasizing the need for urgency. CSEA Lloyd Garrison told EGP he was very happy with the board’s recent decisions. March 31, 2017 Copyright © 2012 Eastern Group Publications, Inc.